The United States screening tour and global online launch of Velcrow Rippers' most recent film, Occupy Love film starts May 3rd. Though the peaceful occupation at Zucotti Park has ended, The Occupy Love film documents how the seeds of The Occupy Movement have sprouted and converged into a Global Super Movement. Social movements like Strike Debt, Occupy Sandy, Transition Towns, Idle No More, Forward on Climate, and One Billion Rising all share common roots and desires. They all call for grassroots, creative, non-violent, direct action to bring needed changes that politicians have failed to lead on. At their core is a love for the environment, community, humanity, and the planet - a love that trumps temporary financial gain and exposes the shallow aspirations of the destructive aspects of a capitalism devoid of compassion, heart, and accountability. In crowds of thousands, it is easy to find the least informed to interview, and this was often the case in corporate media's failed efforts to discredit The Occupy Movement. YouTube consistently showed the personal videos of police abusing power, beating, and spraying teargas in the faces of non-violent activists. The stark contrast between what we witnessed on the streets and the way our media portrayed the events further exposed the issues eating away at our social coherence as a nation and a planet. Finally, we have a fine representation of Occupy from the inside out, a film that allows the people and the movement to define itself beyond the confines of the financial interests that buy our corporate news. Finally we have Occupy Love. As a budding filmmaker myself, I struggled at first to watch a film that is clearly told by individuals in support of Occupy and wondered if it lacked the neutrality needed for a documentary. As I continued to watch, however, I was enthralled to hear the various voices speak freely about their ideas and passions to create a better world for all. The film triumphed in showing that the power of love can unite and heal more beautifully than greed can divide and poison. For this reason, Occupy Love is an inspired, hopeful expression of the power of people to overcome adversity that must be watched by anyone deeply concerned with the fate of our planet. With appearances from visionaries like poet Drew Dellinger of Planetize the Movement; wise elders like Barbara Marx Hubbard, founder of Foundation for Conscious Evolution; Bill McKibben of 350.org; biologist, Rupert Sheldrake; Clayton Thomas-Muller, co-director of Indigenous Environmental Network, and many others, this film gives a well-rounded, diverse, creative, and legitimate perspective on the solutions that we have all been waiting for. Unlike most documentaries about social activism, the environment, and politics that leave the viewer overwhelmed and depressed, this is a film that leaves the viewer hopeful and inspired to get involved. "No revolution can ever succeed as a factor of liberation unless the MEANS used to further it be identical in spirit and tendency with the PURPOSES to be achieved." I used this Emma Goldman quote in a recent article called Beautiful Uprising and it seems to be a common theme in Occupy Love. We are seeing a strong resolve for non-violent, compassionate change in many of these converging movements, and this has a nurturing, creative, feminine quality that is a welcome contrast in a violent world. With all of the divide and opposition that is conjured by the 99% versus the 1%, The Occupy Love Film is really about The 100%. A new website was recently launched called Unanimous Reports, and appears to be the feminine nurturing side of the prankster, hacker collective known as Anonymous. 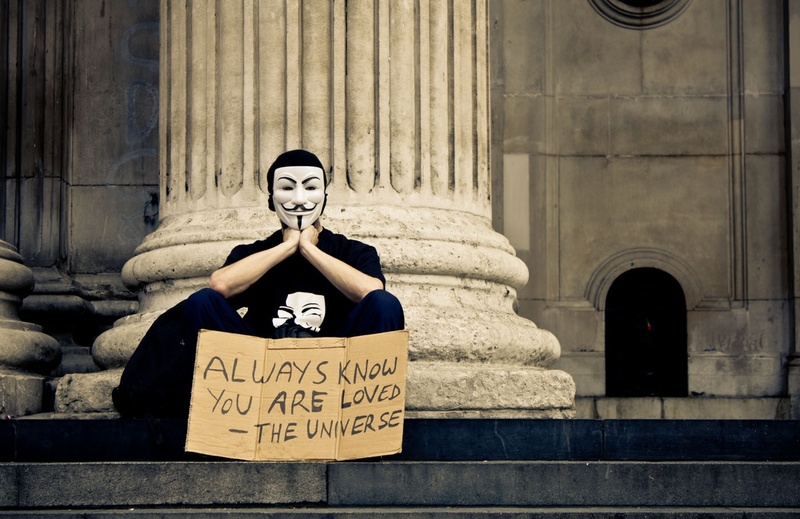 Once again we are seeing the seeds planted by The Occupy Movement sprouting into many forms across many platforms and the driving force behind each of them is love. A love for justice, a love for community, a love for nature, and a desire to seek fulfillment through a love that is greater than monetary, material gain. In a world driven by the dollar, at first it is a bit confusing to understand people being driven by other incentives. It is no wonder there has been so much misunderstanding about The Occupy Movement. The Occupy LoveFilm does a great job at getting across the heart of The Occupy Movement that was felt in the streets across the country and world. I highly recommend watching it, sharing it with your friends and getting involved in the conversation about how to make a better world for all of us. Dr. Martin Luther King stated, "Power without love is reckless and abusive. Love without power is sentimental and anemic." It took a lot of love a lot of courage to gather in the streets and call the worlds attention to the painful realities of our modern world. They may have been pepper-sprayed, misunderstood, and ridiculed, but they set the world ablaze with inspiration. The Occupy Love Film is a great example of the many ways this passion for change continues to bloom in new forms at home and around the world. Evolution and democracy are not spectator sports, sometimes they can be messy, but neither is complete without your involvement. What will you do when you listen to the impulse from your heart to act our your love for life and the community around you?